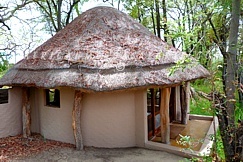 The Chitabe Sandibe Concession, situated in the south-east of the Okavango Delta, is separated from the well-known Moremi Game Reserve by the Gomoti Channel. This eastern half of the concession is characterised by grassy floodplains which separate the Channel from acacia and mopane woodland. The western half of the concession has as its boundary the Santantadibe River and here a variety of typical Okavango habitats – seasonal palm-dotted floodplains, to wooded islands, tranquil waterways and dry woodland – ensure a year-round variety of game viewing and birding experiences. It is this diversity and a mix of Okavango and Kalahari habitats that makes Chitabe Sandibe unique and which allows good concentrations of all the larger predators – lion, leopard, spotted hyaena, cheetah and wild dog – as well as herbivores like giraffe, buffalo, lechwe, tsessebe, impala and elephant. 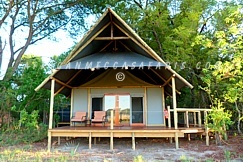 Chitabe Camp is situated on a beautiful old tree-island in a prime location in the south-east of the Okavango Delta. 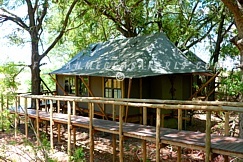 Eight spacious en-suite Meru-style tented rooms are built on elevated wooden decks, each tastefully styled with unique décor. The spacious en-suite bathrooms include double vanity basins together with an indoor as well outdoor shower. Chitabe Lediba is located on the other side of the same island as its sister, Chitabe Camp. A smaller camp, accommodation consists of five canvas tented-style rooms, built on raised decks with luxurious interiors and in tasteful style, complete with en-suite bathrooms, including double vanity basins, indoor and outdoor shower with spectacular views. Sandibe Lodge is tucked away under a cool forest canopy of wild palms and gnarled fig trees, and just a few meters from the water, which glints through a maze of brilliant green papyrus. A private concession, Sandibe has exclusive traversing over 8000 hectares (19800 acres) of wilderness adjacent to the Moremi Game Reserve.